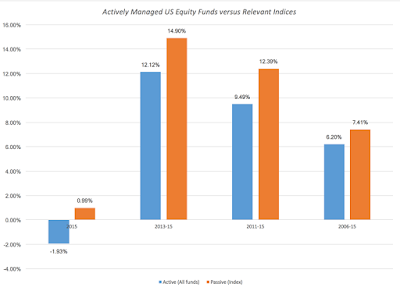 Active Investing: Seeking the Elusive Edge! In my last post, I pointed to the shift towards passive investing that has accelerated over the last decade and argued that much of that shift can be explained by the sub-par performance of active investors. I ended the post on a contradictory note by explaining why I remained an active investor, though the reasons I gave were more personal than professional. I was taken to task on two fronts. The first was that I should have spent less time describing the problem (poor performance of active investors) and more time diagnosing the problem (the reasons for that poor performance). The second was that my rationale for being an active investor, i.e., that I enjoyed investing enough that I would be okay not earning excess returns, could never be used if I sought to manage other people's money and that a defense of active investing would have to be based on something more substantial. Both are fair critiques and I hope to address them in this post. A "Flatter" Investment Word: The investment world is getting flatter, as the differences across active investors rapidly dissipate. From information to processing models to trading platforms, professionals at the active investing game (including mutual funds and hedge funds) and individual investors are on a much more even playing field than ever before. As an individual investor, I have access to much of the information that an analyst working at Merrill Lynch or Fidelity has, whether it be financial statements or market rumors. I am not naive enough to believe that, SEC rules against selective information disclosure notwithstanding, there are no channels for analysts to get "inside" information but much of that information is either too biased or too noisy to be useful. I have almost as much processing power on my personal computer as these analysts do on theirs and can perhaps even put it to better use. In fact, the only area where institutions (or at least some of them) may have an advantage over me is in being able to access information on trading data in real time and investing instantaneously and in large quantities on that information, leading to breast beating about the unfairness of it all. If history is any guide, the returns to these strategies fade quickly, as other large players with just as much trading power are drawn into the game. In fact, while much ink was spilt on flash trading and how it has put those who cannot partake at a disadvantage, it is worth noting that the returns to flash trading, while lucrative at first, have faded, while attracting smaller players into the game. In summary, if the edge that institutional active investors have had over individual active investors was rooted in information and processing power, it has almost disappeared in the United States and has eroded in much of the rest of the world. No Core Philosophy: There is an old saying that if you don't stand for something, you will fall for anything, and it applies to much of active investing. Successful investing starts with an investment philosophy, a set of core beliefs about market behavior that give birth to investment strategies. Too many active investors, when asked to characterize their investment philosophies, will describe themselves as "value investors" (the most mushy of all investment descriptions, since it can mean almost anything you want it to mean), "just like Warren Buffett" (a give away of lack of authenticity) or "investors in low PE stocks" (confusing an investment strategy with a philosophy). The absence of a core philosophy has two predictable consequences: (a) a lack of consistency, where active investors veer from one strategy to another, often drawn to whatever strategy worked best during the last time period and (b) me-tooism, as they chase momentum stocks to keep up with the rest. 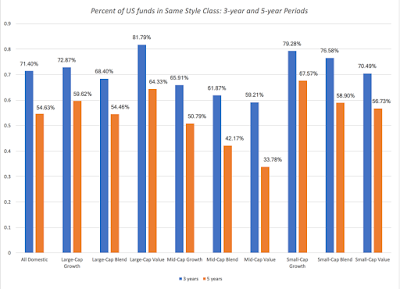 The evidence for both can be seen in the graph below, which looks at the percentages of funds in each style group who remain in that group three and five years later and finds that about half of all US funds change styles within the next five years. Bloated Cost Structures: If there is a core lesson that comes from looking at the performance of active investors, it is that the larger the drag on returns from the costs of being active, the more difficult it is to beat passive counterparts. One component of these costs is trading costs, and the absence of a core investment philosophy, referenced above, leads to more trading/turnover, as fund managers undo entire portfolios and redo them to match their latest active investing avatars. Another is the overhead cost of maintaining an active investing infrastructure that was built for a different market in a different era. The third cost is that of active management fees, set at levels that are not justified by either the services provided or by the returns delivered by that management team. Active money managers are feeling the pressure to cut costs, as can be seen in expense ratios declining over time, and the fund flows away from active money managers has been greatest at highest cost funds. I can only speak for myself but there is not one active investor (nope, not even him, and not even if he was forty years younger) in the world that I have enough reverence for that I would pay 2% (or even .5%) of my portfolio and 20% (or 5%) of my excess returns every year, no matter what his or her track record may be. 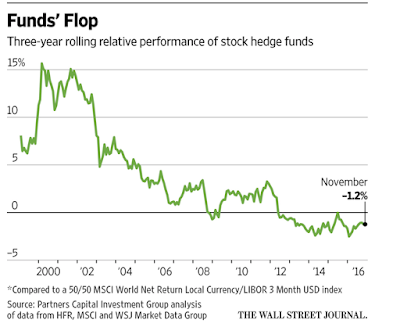 To those who would counter that this is the price you have to pay for smart money, my response is that the smart money does not stay smart for very long, as evidenced by how quickly hedge fund returns have come back to earth. Career Protection: Active money managers are human and it should come as no surprise that they act in ways that increase their compensation and reduce their chances of losing their jobs. First, to the extent that their income is a function of assets under management (AUM), it is very difficult, if not impossible, to fight the urge to scale up a strategy to accommodate new inflows, even if it is not scaleable. Second, if you are a money manager running an established fund, it is far less risky (from a career perspective) to adopt a strategy of sustained, low-level mediocrity than one that tries to beat the market by substantial amounts, with the always present chance that you could end up failing badly. 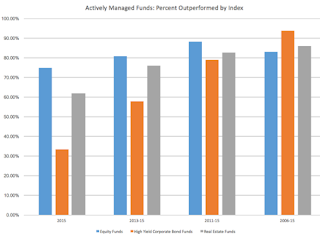 In institutional investing, this has led some of the largest funds to quasi-index, where their holdings deviate only mildly from the index, with predictable results: these funds deliver returns that match the index, prior to transactions costs, and systematically under perform true index funds, after transactions costs, but not by enough for managers to be fired. Third, at the other end of the spectrum, if you are a small, active money manager trying to make a name for yourself, you will naturally be drawn to high-risk, high-payoff strategies, even if they are bad bets on an expected value basis. In effect, you are treating investing as a lottery, where if you win, more money will flow into your funds and if you do not, it is other people's money anyway. There are macroeconomic factors that may also explain why active investing has had more trouble in the last decade, but it is not low interest rates or central banks that are the culprits. It is that the global economy is going through a structural shift, where the old order (with a clear line of demarcation between developed & emerging markets) is being replaced with a new one (with new power centers and shifting risks), upending historical relationships and patterns. 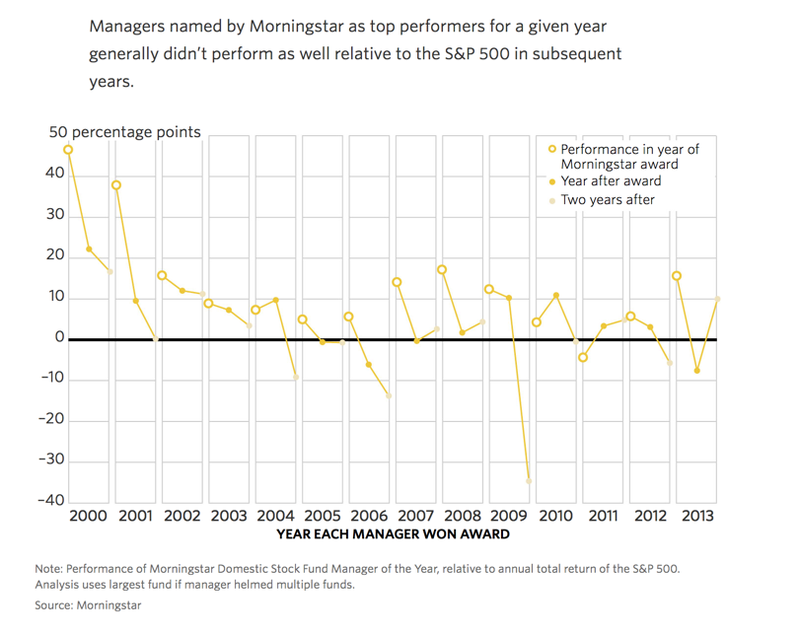 Given how much of active money management is built on mean reversion and lessons learned by poring over US market data from the last century, it should come as no surprise that the payoff to screening stocks (for low PE ratios or high dividend yield) or following rigid investing rules (whether they be centered on CAPE or interest rates) has declined. In all of this discussion, I have focused on the faults of active institutional investors, be they hedge funds or mutual funds, but I believe that their clients bear just as much responsibility for the state of affairs. They (clients) let greed override good sense (knowing that those past returns are too good to be true, but not asking questions), claim to be long term (while demanding to see positive performance every three months), complain about quasi indexing (while using tracking error to make sure that deviations from the index get punished) and refuse to take responsibility for their own financial affairs (blaming their financial advisors for all that goes bad). In effect, clients get the active money managers they deserve. If you accept even some of my explanation of why active investing is failing, at least collectively, there is a kernel of good news in that description. Specifically, the pathway to being a successful active investor lies in exploiting the weakness of the active investment community, especially large institutional investors. Here are my ingredients for active investing success, though I will add the necessary caveat that having all these ingredients will not guarantee an investment payoff. Have a core investment philosophy: In my book on investment philosophies, I argued that there is no best investment philosophy that fits all investors. The best investment philosophy for you is the one that best fits you as an investor, in sync not only with your views about markets but with your personal makeup (in terms of patience, liquidity needs and skill sets). Thus, if you have a long time horizon, believe that value is grounded in fundamentals and that markets under estimate the value of assets in place, old-time value investing may very well be your best choice. In contrast, if your time horizon is short, believe that momentum, not value, drives stock prices, your investment philosophy may be built around technical analysis, centered on gauging price momentum and shifts in it. Balance faith with feedback: In a post on Valeant, I argued that investing requires balancing faith with feedback, faith in your core market beliefs with enough of an acceptance that you can be wrong on the details, to allow for feedback that can modify your investing decisions. In practice, walking this tightrope is exceedingly difficult to do, as many investors sacrifice one at the expense of the other. At one extreme, you have investors whose faith is so absolute that there is no room for feedback and positions once taken can never be reversed. At the other extreme, you have investors who have no faith and whose decisions change constantly, as they observe market prices. Find your investing edge: It has always been my contention that you have to bring something uncommon to the investment table to be able to take something away. Drawing on the language of competitive advantages and moats, what sets you apart does not have to be unique but it does have to be scarce and not easily replicable. That is why I am unmoved by talk of big data in investing and the coming onslaught of successful quant strategies, unless that big data comes with exclusivity (you and only you can exploit it). Here are four potential edges (and I am sure that there others that I might be missing): (a) In sync with client(s): I was not being facetious when I argued that one of my big advantages as an investor is that I invest my own money and hence have a freedom that most active institutional investors cannot have. If you are managing other peoples money, this suggests that your most consequential decision will be the screening your clients, turning money away from those who are not suited to your investment philosophy (b) Sell Liquidity: To be able to sell liquidity to investors seeking it, especially in the midst of a crisis, is perhaps one of investing's few remaining solid bets. That is possible, though, only if you, as an investor, value liquidity less than the rest of the market, a function of both your financial security. (c) Tax Play: Investor price assets to generate after-tax returns and that effectively implies that assets that generate high-tax income (dividends, for instance) will be priced lower than assets that generate low-tax or no-tax income. If you are an investor with a different tax profile, paying either no or low taxes, you will be able to capture some of the return differential. Before you dismiss this as impossible or illegal, recognize that there is a portion of each of our portfolios, perhaps in IRAs or pension funds, where we are taxed differently and may be able to use it to our advantage. (d) Big Picture Perspective: As we become a world of specialists, each engrossed in his or her corner of the investment universe, there is an opening for "big picture" investors, those who can see the forest for the trees and retain perspective by looking across markets and across time. If you are considering actively investing your money, you should be clear about what your own investment philosophy is, and why you hold on to it, and identify the scarce resource that you are bringing to the investment table. If you are considering paying someone else to actively manage your money, my suggestion is that while you should consider that person's track record, it is even more critical that you examine whether that track record is grounded in a consistent investment philosophy and backed up by a sustainable edge. There is much that I still do not know about investing but here are the lessons that I learn, unlearn and relearn every day. First, an investment cannot be a sure-bet and risky at the same time, and you can count me among the skeptical when presented with the next easy way of beating the market. Second, when I believe that I own the high ground in any investment debate, it is a sure sign that I have let hubris get the better of me and that my arguments are far weaker than I think they are. Third, much as I hate to be wrong on my investment choices, I learn more when I concede that "I am wrong" than when I contend that "I am right". For now, I will continue to invest actively, holding true to my investment philosophy centered on intrinsic value, while nurturing the small edges that I have over institutional investors. 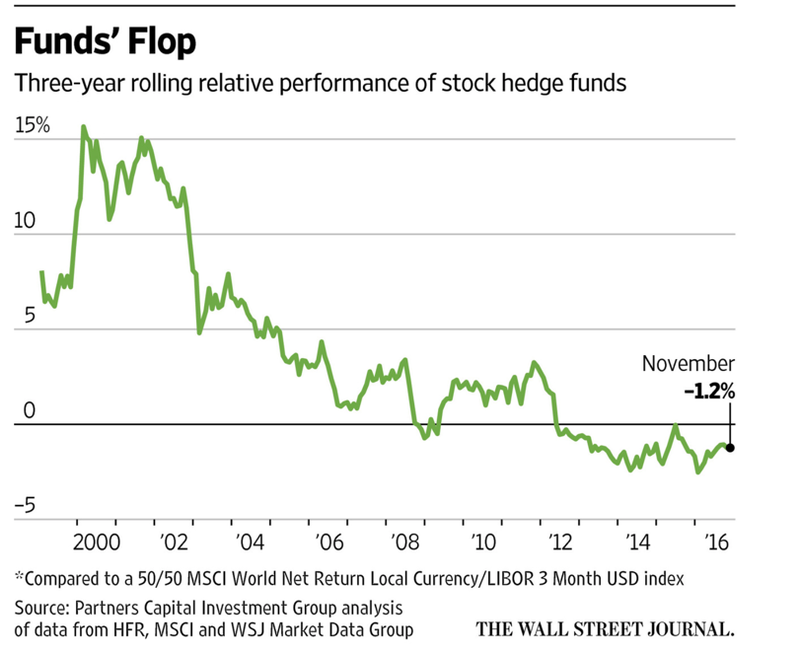 Active Investing: Rest in Peace or Resurgent Force? I was a doctoral student at UCLA, in 1983 and 1984, when I was assigned to be research assistant to Professor Eugene Fama, who wisely abandoned the University of Chicago during the cold winters for the beaches and tennis courts of Southern California. Professor Fama won the Nobel Prize for Economics in 2013, primarily for laying the foundations for efficient markets in this paper and refining them in his work in the decades after. The debate between passive and active investing that he and others at the University of Chicago initiated has been part of the landscape for more than four decades, with passionate advocates on both sides, but even the most ardent promoters of active investing have to admit that passive investing is winning the battle. In fact, the mutual fund industry seems to have realized that they face an existential threat not just to their growth but to their very existence and many of them are responding by cutting fees and offering passive investment choices. 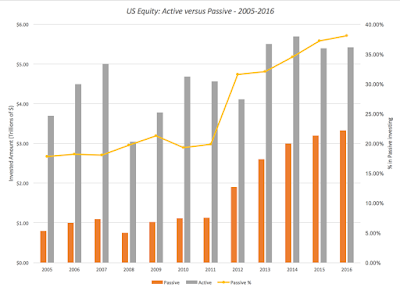 In 2016, passive investing accounted for approximately 40% of all institutional money in the equity market, more than doubling its share since 2005. 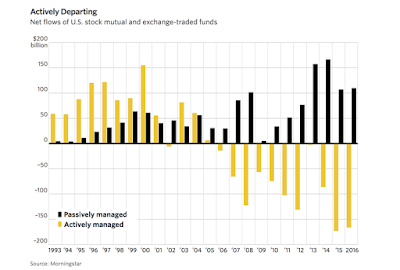 Since 2008, the flight away from active investing has accelerated and the fund flows to active and passive investing during the last decade tell the story. The question is no longer whether passive investing is growing but how quickly and at what expense to active investing. The answer will have profound consequences not only for our investment choices going forward, but also for the many employed, from portfolio managers to sales people to financial advisors, in the active investing business. To understand the shift to passive investing and why it has accelerated in recent years, we have to look no further than the investment reports that millions of investors get each year from their brokerage houses or financial advisors, chronicling the damage done to their portfolios during the course of the year by frenetic activity. Put bluntly, investors are more aware than ever before that they are often paying active money managers to lose money for them and that they now have the option to do something about this disservice. 1. 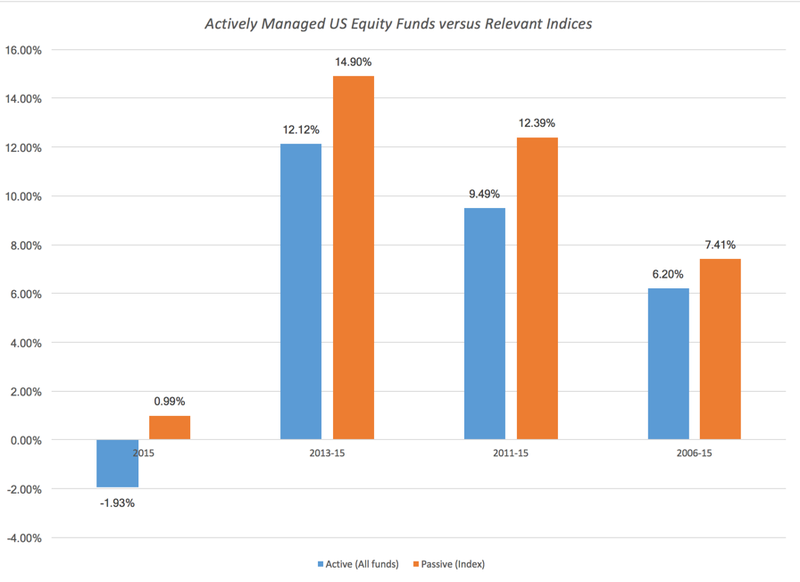 Collectively, active investing cannot beat passive investing (ever)! Note that in this graph, active fund managers in equity, bond and real estate all under perform their passive counterparts, suggesting that poor performance is not restricted just to equity markets. If active money managers cannot beat the market, by construct, how do you explain the few studies that claims to find that they do? There are three possibilities. The first is that they look at subsets of active investors (perhaps hedge funds or professional money managers) rather than all active investors and find that these subsets win, at the expense of other subsets of active investors. The second is that they compare the returns generated by mutual funds to the return on a stock index during the period, a comparison that will yield the not-surprising result that active money managers, who tend to hold some of their portfolios in cash, earn higher returns than the index in down markets, entirely because of their cash holdings. You can perhaps use this as evidence that mutual fund managers are good at market timing, but only if they can generate excess returns over long periods. The third is that these studies are comparing returns earned by active investors to a market index that might not reflect the investment choices made by the investors. Thus, comparing small cap active investors to the S&P 500 or global investors to the MSCI may reveal more about the limitations of the index than it does about active investing. The standard defense that most active investors would offer to the critique that they collectively underperform the market is that the collective includes a lot of sub-standard active investors. I have spent a lifetime talking to active investors who contend that the group (hedge funds, value investors, Buffett followers) that they belong to is not part of the collective and that it is the other, less enlightened groups that are responsible for the sorry state of active investing. In fact, they are quick to point to evidence often unearthed by academics looking at past data that stocks with specific characteristics (low PE, low Price to book, high dividend yield or price/earnings momentum) have beaten the market (by generating returns higher than what you would expect on a risk-adjusted basis). Even if you conclude that these findings are right, and they are debatable, you cannot use them to defend active investing, since you can create passive investing vehicles (index funds of just low PE stocks or PBV stocks) that will deliver those excess returns at minimal costs. The question then becomes whether active investing with any investment style beats a passive counterpart with the same style. SPIVA, S&P’s excellent data service for chronicling the successes and failures of active investing, looks at the excess returns and the percent of active investors who fail to beat the index, broken down by style sub-group. 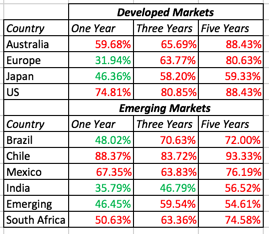 There are glimmers of hope in the one-year returns in Europe and Japan and in the emerging markets, but there is not a single geography where active money managers have beaten the index over the last five years. Note that the numbers in the table, when you look at all US equity funds, suggest very little continuity in the process. In fact, the only number that is different from 25% (albeit only marginally significant on a statistical basis) is that transition from the first to the fourth quartile, with a higher incidence of movement across these two quartiles than any other two. That should not be surprising since managers who adopt the riskiest strategies will spend their time bouncing between the top and the bottom quartiles. While the numbers in 2000 and 2001 look good, the years since have not been kind to super performers who return to earth quickly in the subsequent years. We could try to explain the failure of active investing to deliver consistent returns over time with lots of reasons, starting with the investment world getting flatter, as more investors have access to data and models but I will leave that for another post. Suffice to say, no matter what the reasons, active investing, as structured today, is an awful business, with little to show for all the resources that are poured into it. In fact, given how much value is destroyed in this business, the surprise is not that passive investing has encroached on its territory but that active investing stays standing as a viable business. Since it is no longer debatable that passive investing is winning the battle for investor money, and for good reasons, the question then becomes what the consequences will be. The immediate effects are predictable and painful for active money managers. The active investing business will shrink: The fees charged for active money management will continue to decline, as they try to hold on to their remaining customers, generally older and more set in their ways. Notwithstanding these fee cuts, active money managers will continue to lose market share to ETFs and index funds as it becomes easier and easier to trade these options. The business will collectively be less profitable and hire fewer people as analysts, portfolio managers and support staff. 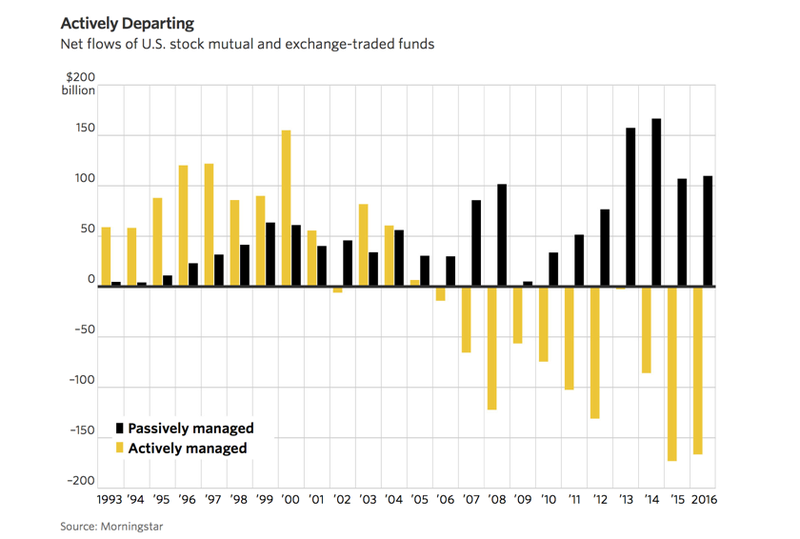 If the last few decades are any indication, there will be periods where active money management will look like it is mounting a comeback but those will be intermittent. More disruption is coming: In a post on disruption, I noted that the businesses that are most ripe for disruption are ones where the business is big (in terms of dollars spent), the value added is small relative to the costs of running the business and where everyone involved (businesses and customers) is unhappy with the status quo. That description fits the active money management like a glove and it should come as no surprise that the next wave of disruption is coming from fintech companies that see opportunity in almost every facet of active money management, from financial advisory services to trading to portfolio management. While active investing has contributed to its own downfall, there is a dark side to the growth of passive investing and many in the active money management community have been quick to point to some of these. Corporate Governance: As ETFs and index funds increasing dominate the investment landscape, the question of who will bear the burden of corporate governance at companies has risen to the surface. After all, passive investors have no incentive to challenge incumbent management at individual companies nor the capacity to do so, given their vast number of holdings. As evidence, the critics of passive investors point to the fact that Vanguard and Blackrock vote with management more than 90% of the time. I would be more sympathetic to this argument if the big active mutual fund families had been shareholder advocates in the first place, but their track record of voting with management has historically been just as bad as that of the passive investors. Information Efficiency: To the extent that active investors collect and process information, trying to find market mistakes, they play a role in keeping prices informative. This is the point that was being made, perhaps not artfully, by the Bernstein piece on how passive investing is worse than Marxism and will lead us to serfdom. I wish that they had fully digested the Grossman and Stiglitz paper that they quote, because the paper plays out this process to its logical limit. In summary, it concludes that if everyone believes that markets are efficient and invests accordingly (in index funds), markets would cease to be efficient because no one would be collecting information. Depressing, right? But Grossman and Stiglitz also used the key word (Impossibility) in the title, since as they noted, the process is self-correcting. If passive investing does grow to the point where prices are not informationally efficient, the payoff to active investing will rise to attract more of it. Rather than the Bataan death march to an arid information-free market monopolized by passive investing, what I see is a market where active investing will ebb and flow over time. Product Markets: There are some who argue that the growth of passive investing is reducing product market competition, increasing prices for customers, and they give two reasons. The first is that passive investors steer their money to the largest market cap companies and as a consequence, these companies can only get bigger. The second is that when two or more large companies in a sector are owned mostly by the same passive investors (say Blackrock and Vanguard), it is suggested that they are more likely to collude to maximize the collective profits to the owners. As evidence, they point to studies of the banking and airline businesses, which seem to find a correlation between passive investing and higher prices for consumers. I am not persuaded or even convinced about either of these effects, since having a lot of passive investors does not seem to provide protection against the rapid meltdown of value that you still sometimes observe at large market cap companies and most management teams that I interact with are blissfully unaware of which institutional investors hold their shares. The rise of passive investing is an existential threat to active investing but it is also an opportunity for the profession to look inward and think about the practices that have brought it into crisis. I think that a long over-due shakeup is coming to the active investing business but that there will be a subset of active investors who will come out of this shakeup as winners. As to what will make them winners, I have to hold off until another post. 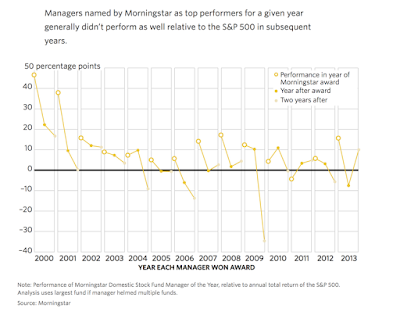 Should you be an active investor or are you better off putting your money in index funds? The answer will depend on not only what you bring to the investment table in the resources but also on your personal make-up. I have long argued that there is no one investment philosophy that works for all investors but there is one that is just right for you, as an investor. In keeping with this philosophy of personalized investing, I think it behooves each of us, no matter how limited our investment experience, to try to address this question. To start this process, I will make the case for why I am an active investor, though I don’t think any you will or should care. I will begin by listing all the reasons that I will not give for investing actively. Since I use public information in financial statements and databases, my information is no better than anyone else’s. While my ego would like to push me towards believing that I can value companies better than others, that is a delusion that I gave up on a long time ago and it is one reason that I have always shared my valuation models with anyone who wants to use them. There is no secret ingredient or special sauce in them and anyone with a minimal modeling capacity, basic valuation knowledge and common sense can build similar models. So, why do I invest actively? First, I am lucky enough to be investing my own money, giving me a client who I understand and know. It is one of the strongest advantages that I have over a portfolio manager who manages other people’s money. Second, I have often described investing as an act of faith, faith in my capacity to value companies and faith that market prices will adjust to that value. I would like to believe that I have that faith, though it is constantly tested by adverse market movements. That said, I am not righteous, expecting to be rewarded for doing my homework or trusting in value. In fact, I have made peace with the possibility that at the end of my investing life, I could look back at the returns that I have made over my active investing lifetime and conclude that I could have done as well or better, investing in index funds. If that happens, I will not view the time that I spend analyzing and picking stocks as wasted since I have gained so much joy from the process. In short, if you don’t like markets and don’t enjoy the process of investing, my advice is that you put your money in index funds and spend your time on things that you truly enjoy doing!